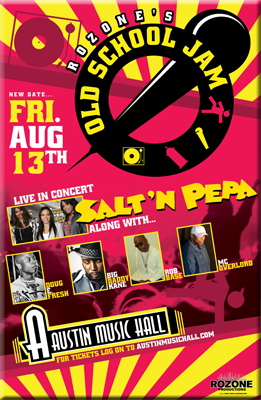 From the superhuman department... Rozone's Old School Jam with Salt N Pepa, Doug E. Fresh, Big Daddy Kane, Rob Base and MC Overlord @ Austin Music Hall on Aug 13th! What a line up! Will definitely be a night for posterity. The group, consisting of Cheryl James ("Salt", now Cheryl Wray), Sandra Denton ("Pepa"), and Deidra "Dee Dee" Roper (Spinderella), has sold over 15 million albums and singles worldwide. Salt-N-Pepa, one of the best selling female rap acts, have six of their single releases certified either platinum or gold in the United States by the RIAA. Originally calling themselves Super Nature (for just the first single), James and Denton debuted in 1985 with the single "The Showstopper", an answer record to Doug E. Fresh's hit single "The Show". "The Showstopper" was produced by Hurby Azor. The song utilized a melody from the 1985 film Revenge of the Nerds. The finished recording garnered some airplay on a New York City rap radio program, and the independent Pop Art Records gave it an official release. "The Showstopper" became a modest R&B hit.